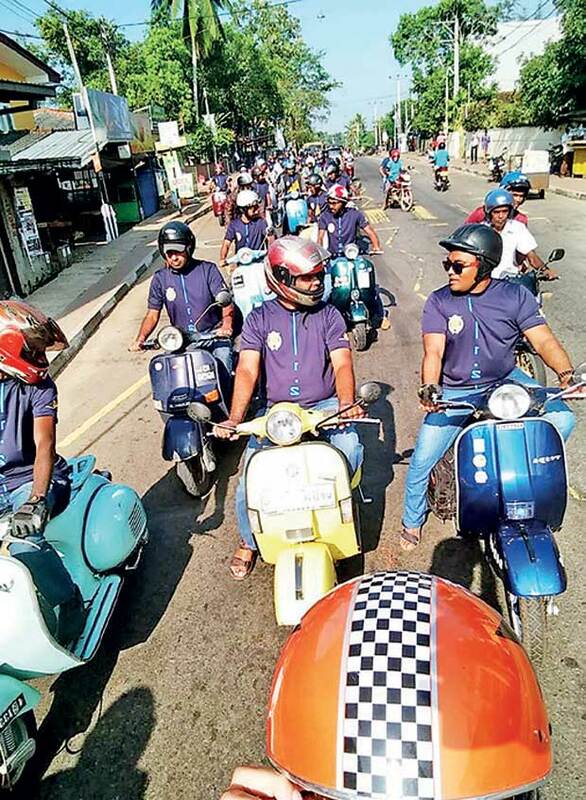 The Ceylon Scooter Club had its annual gathering as usual on February 4. This year, more than eighty machines were on display, making it even more colourful than last year’s event. As if to make up for last year’s low-key event, with its short run from the Mahaweli Centre to Independence Square, the organisers came up with a spectacular run this year – all the way from Borelesgamuwa to the culmination point at Gorakana, old Moratuwa Road. The scooters came in almost all colours of the spectrum, with bright red, blue, green and orange dominating. The riders were mostly young, though most of the machines dated from the 1960s, 70s and 80s. Long hair tied into buns were common enough to be a trademark, and all riders wore the black t-shirts with the club logo distributed free of charge by the organisers. 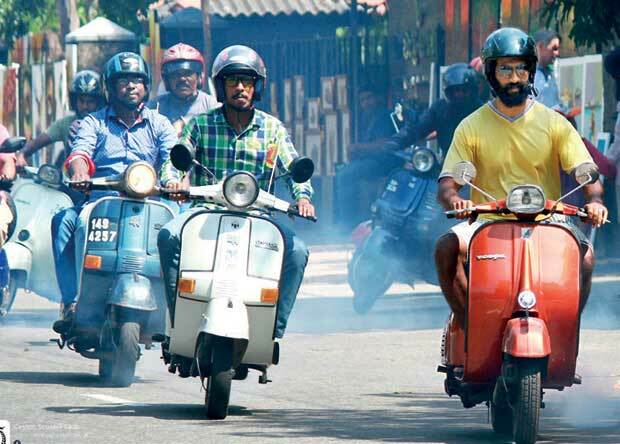 "The scooters came in almost all colours of the spectrum, with bright red, blue, green and orange dominating. 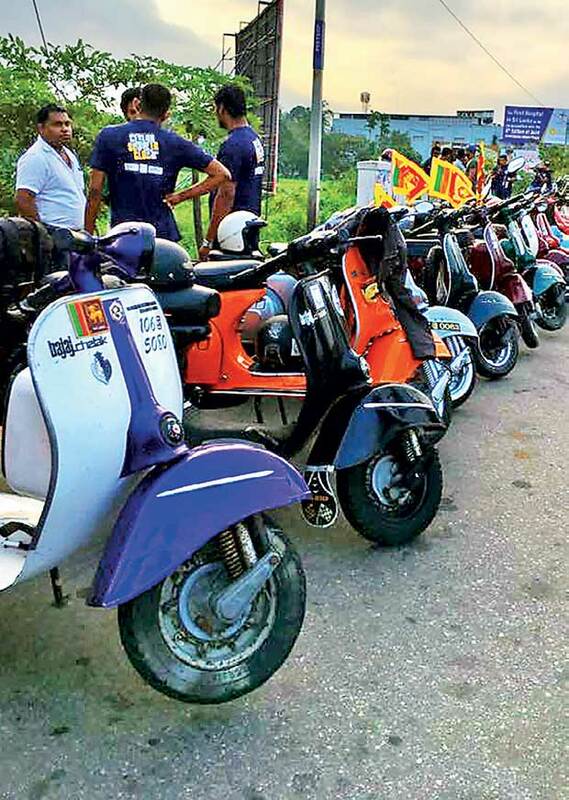 The riders were mostly young, though most of the machines dated from the 1960s, 70s and 80s"
The parade went to Kalutara via Piliyandala and Kesbewa, turning back at the Kalutara clock tower to make its way along the Galle Road to Hotel Aqua Pearl via Panadura. By noon, all the scooters were parked on a sprawling lawn by the picturesque Bolgoda Lake. Italian Vespas take pride of place in this setting, but beautifully restored Indian Bajajs looked like strong competitors. But the most distinguished visitor was a Lambretta 150cc which had arrived all the way from Galle. Lambrettas, imported from Italy and assembled here by Upali Motors Corporation in the 1970s, were once a common sight but have become a rare sight today. The CSC is an all-volunteer group run by a few enthusiasts. They are naturally short of money and fundraising ideas were discussed during the pre-launch meeting. The organizing committee made an urgent appeal for more volunteers to relieve their work burden, especially that of handling the accounts; unfortunately, they were no volunteers. The event concluded at five pm. A club auction for April-May and an annual trip in August were mooted.